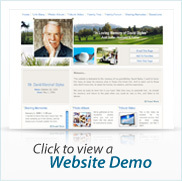 Funeral Memorial Video, Funeral Tribute Video Software . Helping families connect, communicate, and remember. With our proprietary Memorial Website technology, Life Tributes will create a personalized website automatically that can remain online forever and establish you and your firm as a Library of Lives. Yes, I said library. Can you imagine having all of your client families’ friends and relatives coming back to YOUR web site to learn about their loved one!? Beyond creating value, the exposure alone will be huge! It will create instant value to your firm and put you in a position where you are helping your families tell their loved ones life story. Think about how powerful that could be! And you could start offering this instantly! 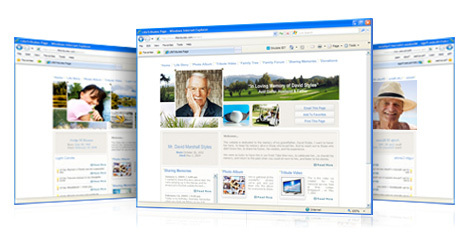 Using information you have already entered in Life Tributes, our memorial web site generator will create a dynamic web site in minutes, email editing instructions to your client families’ next of kin so the customization of each site is out of your hands, and the only way to access it is through YOUR web site! Memorial web sites can be fully customized without any HTML experience and include music and live animations, and be thematically co-coordinated with the other personalization products available through Life Tributes. 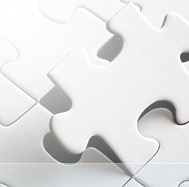 Creating world-class memorial sites couldn't be any easier or more affordable. To request a FREE trial and to see how Life Tributes can be your complete source for all your personalization needs, please click here or call us at (800) 798-2575.